John Singleton Copley (1738 - 1815) was an American painter, born presumably in Boston, Massachusetts. He is famous for his portraits of important figures in colonial New England, depicting in particular middle-class subjects. His paintings were innovative in their tendency to depict artifacts relating to these individuals' lives. From about 1760 until 1774, Copley painted the finest portraits of the colonial period. His forthright approach to characterization was quite different from the flattering, contemporary English society portrait. His directness of observation resulted in portraits that conveyed the innate nobility and heroic qualities of the people who pioneered the early American way of life. He is considered the greatest U.S. painter of the eighteenth century. He was also one of the pioneers of the private exhibition, orchestrating shows and marketing prints of his own work to mass audiences. Born to Richard and Mary Singleton Copley, except for a family tradition that speaks of his precocity in drawing, nothing is known of Copley's schooling or of the other activities of his boyhood. His letters, the earliest of which is dated September 30, 1762, reveal a fairly well-educated man. His widowed mother's marriage in 1748 to Peter Pelham, a London-trained engraver, introduced Copley to portraiture through Pelham's European engravings. Pelham's death, in 1751, forced the impoverished youth to set himself up as a fledgling artist. Painting in the colonies at this time consisted almost wholly of portraiture of prominent families or commercial signs, both usually executed by poorly trained, itinerant artist tradesmen. Copley, with studious meticulousness, slowly refined his natural ability, assimilating technique through observing the work of other local artists, especially Robert Feke and Joseph Blackburn. Lord Lyndhurst, his son, wrote that "he (Copley) was entirely self taught…" He complained, in a letter to Benjamin West on November 12, 1766: "In this Country as You rightly observe there is no examples of Art, except what is to [be] met with in a few prints indifferently executed, from which it is not possible to learn much".. The excellence of his own portraits was not accidental or miraculous; it had an academic foundation. A book of Copley's studies of the human body, now at the British Museum, proves that before he was twenty, whether with or without help from a teacher, he was making anatomical drawings with much care and precision. It is likely that through the fortunate associations of a home and workshop in a town which had many craftsmen, he had already learned his trade at an age when the average art student of a later era was only beginning to draw. Copley was married in 1769, to Susanna Farnham Clarke, whose father, Richard, was one of Boston’s richest merchants and local agent for the British East India Company. The couple had six children during their 45-year marriage. Besides painting portraits in oil, Copley was a pioneer American pastellist. By the 1760s, he acquired pastels from Swiss painter Jean-Étienne Liotard, and began to demonstrate his genius for rendering surface textures and capturing emotional immediacy. Copley's fame was established in England by the exhibition, The Boy with the Squirrel in 1766, which depicted his half-brother, Henry Pelham, seated at a table and playing with a pet squirrel. This picture, which made the young Boston painter a Fellow of the Society of Artists of Great Britain, had been painted the preceding year. Benjamin West, the Pennsylvanian painter, wrote letters to Copley encouraging him to share his work in England, and effectively convinced him his prospects in a colonial town were too limited. Copley, in his letters to West of October 13 and November 12, 1766, gleefully accepted an invitation to send other pictures to the Exhibition in England and mournfully referred to himself as "peculiarly unlucky in Liveing in a place into which there has not been one portrait brought that is worthy to be call'd a Picture within my memory." Although later somewhat reluctant due to his comfortable income in America and his family's needs, he agreed to go to Europe. As an English painter, Copley began a promising career in 1775, that seemed destined for great success but ended in gloom and adversity. His technique was so well established, his habits of industry so well confirmed, and the reputation that had preceded him from America was so extraordinary, that he could hardly fail to make a place for himself among British artists. He himself, however, "often said, after his arrival in England, that he could not surpass some of his early works". The deterioration of his talent was gradual, however, so some of the "English Copleys" are superb paintings. 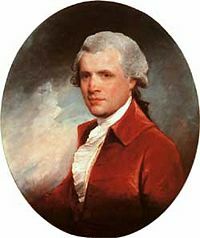 Following a fashion set by West and others, Copley began to paint historical pieces as well as portraits. His first foray into this genre was A Youth Rescued from a Shark, its subject based on an incident related to the artist by Brook Watson, who had been attacked by a shark while swimming in Havana harbor as a 14 year old boy. Engravings from this work achieved an enduring popularity. 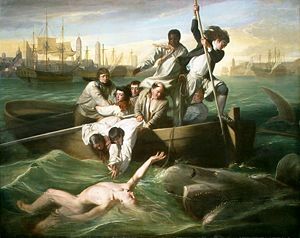 Because of the acclaim accorded Watson and the Shark, he devoted much of his time thereafter to painting elaborate history pieces, as they were considered a higher form of painting than portraiture. The Death of Major Pearson (1782-1784) celebrates the 1781 defeat of the French at the Isle of Jersey. The Death of the Earl of Chatham (1781) depicts William Pitt's death of a stroke in the House of Lords in April 1778, as he rose to debate the war with the Colonies. His fame as a historical painter was made by The Death of Lord Chatham, which brought him denunciation from Sir William Chambers, president of the Royal Academy, who objected to its being exhibited privately in advance of the Academy's exhibition. Despite some troubled exchanges with the president, engravings from the Chatham picture later sold well in England and America. Copley's adventures in historical painting were all the more successful because of his painstaking efforts to obtain good likenesses of personages and correct accessories of their periods. He traveled much in England to make studies of old portraits and actual localities. He created such pieces as The Red Cross Knight, Abraham Offering up Isaac, Hagar and Ishmael in the Wilderness, and others. He continued to paint portraits, among them those of several members of the royal family and numerous British and American celebrities. Between 1776 and 1815, he sent forty-three paintings to exhibitions of the Royal Academy, of which he was elected an associate member in the former year. His election to full membership occurred in 1783. The enormous Siege of Gibraltar (1791), finished after at least 5 years' work, commemorates the bombardment of Gibraltar by the Spanish and French. Copley employed something of the meticulous realism of his Boston period but on a vast scale. He made models of the fortress and gunboats and even traveled to Germany to get accurate likenesses of the Hanoverian commanders of the siege. But the artistic control of his Boston period was lost in these increasingly grandiose works. Critical reception was lukewarm, and Copley's portrait commissions began to dwindle. Copley would have liked to return to America, but his professional routine prevented this. He was politically more liberal than his relatives and painted the Stars and Stripes over a ship in the background of Elkanah Watson's portrait on December 5, 1782, after listening to George III's speech formally acknowledging American independence. Copley's contacts with New England people continued as he painted portraits of John Adams, John Quincy Adams, and other Bostonians who visited England. His daughter, Elizabeth, was married in August 1800, to Gardiner Greene of Boston, a wealthy gentleman whose descendants preserved much of the correspondence of the Copley family. In his last fifteen years, though painting persistently, Copley experienced depression and disappointment. The Napoleonic Wars brought hard times. His house in London was expensive to maintain and his talented son's education was costly. It grieved the father that after the young barrister began to earn his way it became necessary to accept his help in supporting the home. An expensive lifestyle and unsuccessful sales of his artwork made borrowing inevitable and some canvases involving years of labor were left unsold. The artist's deteriorating physical and mental health produced anxiety and in 1810, he had a bad fall which kept him from painting for a month. Despite continuing financial decline, the loss of his property in Boston, and the consequent requests for money from his family, Copley continued to paint. On March 4, 1812 he wrote: "I am still pursuing my profession in the hope that, at a future time, a proper amount will be realized from my works, either to myself or family, but at this moment all pursuits which are not among the essentials of life are at a stand." In August 1813, Mrs. Copley wrote that, although her husband was still painting, "he cannot apply himself as closely as he used to do." She reported to her son in April 1814: "Your father enjoys his health but grows rather feeble, dislikes more and more to walk; but it is still pleasant for him to go on with his painting." In June 1815, the Copleys entertained John Quincy Adams, with whom they discussed the new terms of peace between the United States and the United Kingdom. In the letter describing this visit, the painter's infirmities are said to have been increased by "his cares and disappointments." A note of August 18, 1815, informed the Greenes that Copley, while at dinner, had had a paralytic stroke. He seemed at first to recover and in late August was able to continue painting. A second shock occurred, however, and he died on September 9, 1815. "He was perfectly resigned," wrote his daughter Mary, "and willing to die, and expressed his firm trust in God, through the merits of our Redeemer." He was buried in Highgate Cemetery in a tomb belonging to the Hutchinson family. How deep into debt Copley had fallen in his latest years was hinted at in Mrs. Copley's letter of February 1, 1816, to Gardiner Greene in which she gave details of his assets and borrowings and predicted: "When the whole property is disposed of and applied toward the discharge of the debts a large deficiency must, it is feared, remain." The estate was settled by Copley's son, later Lord Lyndhurst, who maintained the establishment in George St., supported his mother up to her death in 1836, and kept the ownership of many of the artist's unsold pictures until March 5, 1864, when they were sold at auction in London. Several of the works then dispersed are now in American collections. Copley was the greatest and most influential painter in colonial America, producing about 350 works of art. With his startling likenesses of persons and things, he came to define a realist art tradition in America. His visual legacy extended throughout the nineteenth century in the American taste for the work of artists as diverse as Fitz Henry Lane and William Harnett. In Britain, while he continued to paint portraits for the élite, his great achievement was the development of contemporary history painting, which was a combination of reportage, idealism, and theater. He was also one of the pioneers of the private exhibition, orchestrating shows and marketing prints of his own work to mass audiences that might otherwise attend exhibitions only at the Royal Academy, or who previously had not gone to exhibitions at all. Boston's Copley Square and Copley Plaza bear his name. ↑ Martha Babcock Amory, Domestic and Artistic Life of John Singleton Copley (1882), p. 9. ↑ "Copley-Pelham Letters," p. 51. ↑ "Copley-Pelham Letters," p. 26. ↑ Allan Cunningham, The Lives of the Most Eminent British Painters, Sculptors, and Architects, 1830-33 v. V, p. 167. ↑ Lives of Lord Lyndhurst and Lord Brougham, 1869. National Gallery of Art: John Singleton Copley. Find-A-Grave profile for John Singleton Copley. 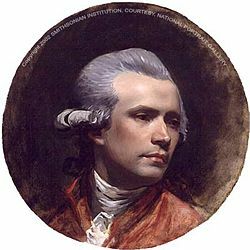 History of "John Singleton Copley"
This page was last modified on 22 May 2018, at 15:10.